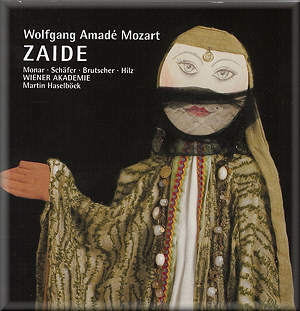 Zaide is an unfinished, though very full, fragment which Mozart never saw performed. It has been completed various times, though, and it is worth a listen, not least because it dates from a key moment in Mozart’s life. He wrote it after his major tour of 1777-79 wherein he had sought a commission for a new opera from musical centres as prestigious as Mannheim and Paris. It had all come to nothing, though, and he arrived back at Salzburg in low spirits. It was then, however, that he heard that Emperor Joseph II had expressed an interest in founding a German Opera in Vienna, and so Mozart began work on Zaide to prepare himself for what might become an imperial commission. The text was written by his friend Johann Andreas Schachtner, who had also written the libretto for Bastien and Bastienne, and for his subject he chose a “Turkish” story, so fashionable in Austria at that time. The story centred on a European, Gomatz, working as a slave for Sultan Soliman. He falls in love with Zaide, the Sultan’s favourite, and they plan to escape assisted by another European, Allazim. However, they are thwarted and face a sentence of torture and death until the Sultan relents and forgives them. Knowing all this, it’s not surprising that many musicologists see Zaide as a dry-run for Seraglio and there are some undeniable similarities; Zaide’s Act 2 arias Trostlos and Tiger are similar in tone to Konstanze’s Traurigkeit and Martern aller Arten. But it would be a mistake to see Zaide as anything other than what it is. It is nowhere near as well developed as the later work and Mozart’s melodic invention isn’t nearly as inspired. It still has lots to recommend it, though. Mozart broke off because he felt the denouement of the plot was too implausible, so for this recording we are provided with a Brian Michaels’ rearrangement of the Quartet K 479 as a finale, and very satisfying it is, too. Arguably too much so, in fact: the later quartet is on a much higher level of inspiration than what precedes it so that you can easily see the join. In addition there is no overture, so this version, like most others, plays the work G major Symphony No. 32 (K 318) instead, and it works very well. The Wiener Akademie are a small period band, and their playing has a zesty energy to it that is evident from the overture onwards. The recording engineers capture them close-up but still preserve a sense of intimacy. Conductor Martin Haselböck keeps things moving along at a fair lick and he cuts the spoken dialogue to a minimum so that the action is not held up, and a good thing too, as a work like this can easily drag. He, at least, is convinced by this work. He knows how to relax, though, such as in the beautiful and well known melody of Ruhe Sanft, Zaide’s first aria in Act 1. Isabel Monar sings with capability but not much else: her singing sounds rather workaday, and top notes sound strained at various points throughout the set. It’s also difficult to believe that this Zaide is a naïve young maiden – she sounds rather knowing and mature here. Christian Hiltz’s Allazim has the opposite problem: he sounds noble, but too young for the elderly sage he is meant to be portraying. Markus Schäfer’s tenor is earnest, but not especially interesting and certainly not beautiful. When he falls in love with Zaide’s portrait he does so rather less subtly than Tamino does with Pamina’s, but that’s more Mozart's fault than his. The best of the singers is Christian Hilz as the Sultan. He is missing for whole of Act 1, but as soon as he arrives, singing an aria of murderous rage accompanied by raging trumpets and drums, the dramatic pace quickens and we feel more involvement. His melologue (spoken dialogue to orchestral accompaniment) is much more successful than Gomatz’s in Act 1, but both are interesting as they remain, to my knowledge, the only such examples in Mozart’s output. It’s a dramatic problem, though, that the Sultan sounds much better than Gomatz, who is meant to be the hero. His second aria is the highlight of the piece. The quartet which precedes the finale is great music, but it is full of individuals rather than an ensemble, though they blend much better for the adapted finale itself. The catalogue isn’t exactly bursting with recordings of Zaide at present, so this one will serve the purpose if you want the work, but it would be far better to see the return of Paul Goodwin’s version with the AAM on Harmonia Mundi. This one has too many inconsistencies.